Crunch! Crack! Poo-ting! Oh, man! If you’ve ever heard those noises coming from your precious Uke, we share your pain. FEAR NOT, HOWEVER! We’ve got you covered. Here’s what you need to know before traveling with ANY ukulele. Overall Winner? The Eddy Finn Travel Ukulele. Just 1.75 inches deep, quality spruce and mahogany build and a 3-year warranty? How do they do that at this price? Winner by a clear margin. Check discount here. Quality Winner? The Kala KA-SSTU Soprano Travel Ukulele. Weighing in at just 13 ounces, this quality ultra-thin uke will fit in your backpack, briefcase or suitcase with ease. Check discount here. Budget Winner? Can’t get much better than the Hola! Music HM-21. Not many ukes under $50 offer what this does. At the time of writing, there’s a pretty great deal on for these too! Search for it here. Plastic? Heading to the beach or fond of “mudding”? Here’s our best pick. The Kala Makala Waterman. 9 million people can’t be wrong. The ultimate go anywhere Uke! Why not get one that glows in the dark? If you spend much of your time traveling, carrying around your ukulele isn’t always easy. Ukuleles can be quite thick and fragile. It’s not uncommon for them to get damaged in your car or while traveling through the airport. That’s why you should get a travel ukulele, which are designed to be durable for your on-the-go lifestyle. The main feature of a travel ukulele is typically the thinner body. On a standard ukulele, the body is typically 3.5 to 4 inches thick. With a travel ukulele, you’d be looking at closer 1.5 to 2.5 inches thick. This can make it a lot easier to travel with your ukulele in a carry-on bag or backpack. Travel ukulele’s also typically come with geared tuners, which are very reliable and hold a tune well even when traveling. One drawback of travel ukuleles is they are typically more expensive than the best beginner ukuleles, so for most people, it only makes sense to buy one if you’re limited on space or traveling often. 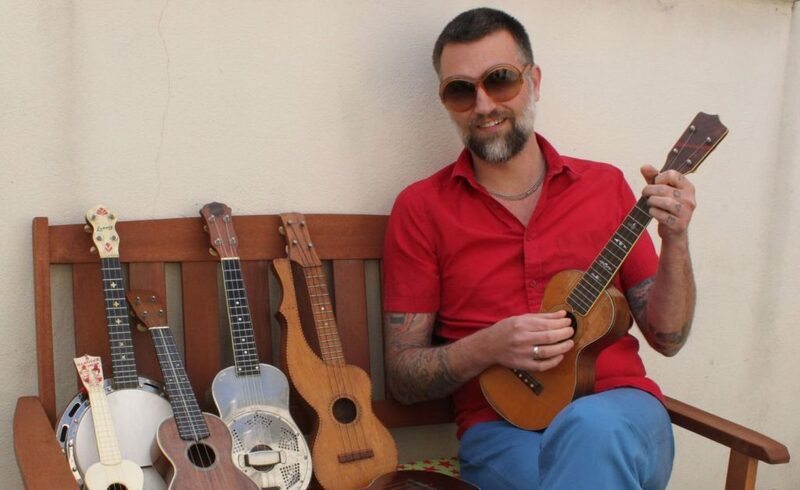 A travel ukulele also has less overall volume and less deep of a sound than a standard ukulele, which some people actually prefer but for many, it can be a downside. Like most musical instrument purchases, the first thing you’ll want to consider when going to buy a travel ukulele is what’s your budget? Travel ukuleles tend to be more expensive than a regular ukulele since they’re made to be compact and built with more precision. Luckily, you can get a travel ukulele for under $100 as we will show in the list below. Most options will run closer to $150 and above, however! 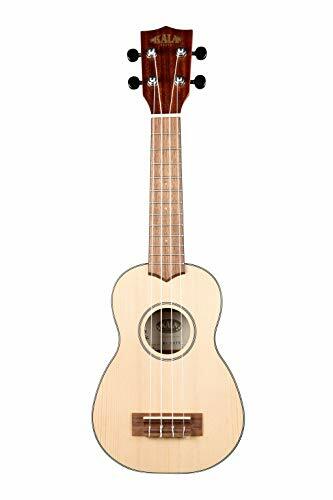 Another aspect you’ll need to decide on is what size ukulele you’ll want. 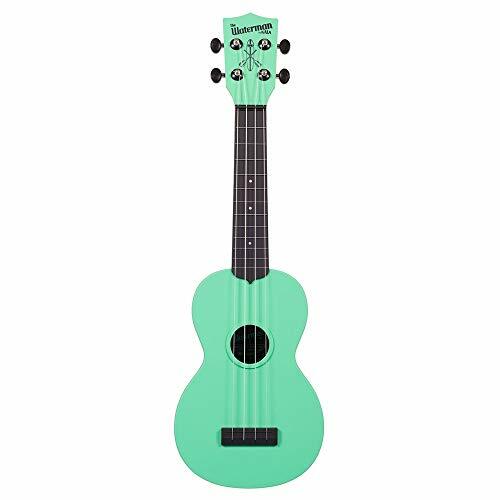 A smaller soprano ukulele will give you best flexibility for traveling due to its small size, but you may want a bigger ukulele for the deeper sound it produces. If you’re on a real tight budget and your primary concern for you ukulele is the durability of it, check out our guide to the best plastic ukulele. These can typically be found for $50 or less and offer a lot of value! Our all-things-considered winner is the Eddy Finn Travel Ukulele! Though not as big a name as some of the other names on this list, that works in Eddy Finn’s favor as they continue to innovate in the ukulele market since their launch in 2010. With a focus on quality and a 3-year warranty, this uke took the top spot for a reason. This ukulele has a slim body at just 1.75 inches deep, and it comes in a comfortable concert size. The top is made of Spruce wood in a natural finish with mahogany backs and sides. The sound hole is in the shape of a shark fin, the distinctive signature of the Eddy Finn brand. Buying a travel ukulele without breaking the bank is tough! That’s why we named the Hola! Music HM-21 is our best cheap travel ukulele! It’s a compact sized ukulele measuring 21″ long, so you should be able to stuff it anywhere! The HM-21 has a maple body, mahogany neck and a rosewood fingerboard and bridge. 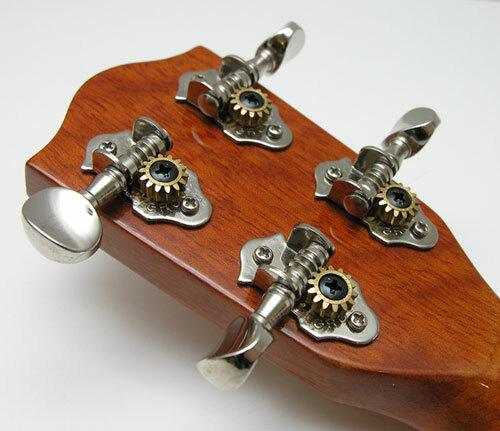 The tuners are geared to stay firm. 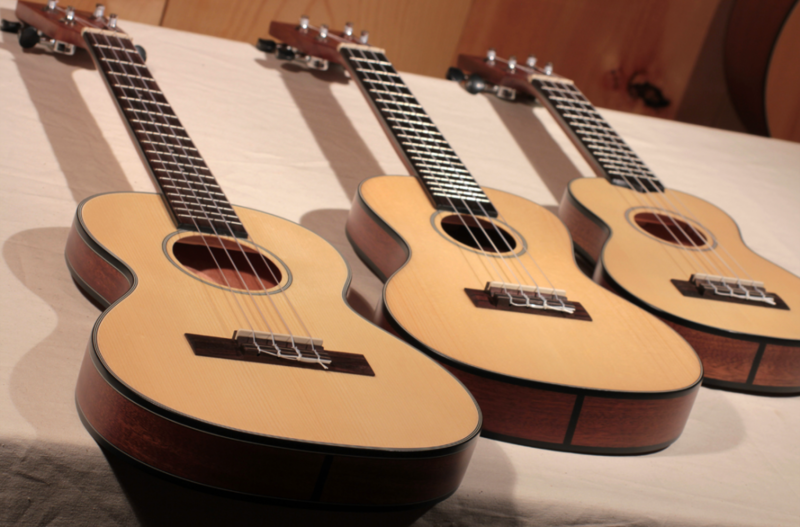 These are all high-quality materials that we love to see on ukuleles of all price ranges! The HM-21 also comes in a full range of groovy colors. Both kinds of wood sound great for ukulele. It mostly comes down to preference – natural, purple or green? At this price, you can afford to leave your higher quality uke safely locked up at home! The Kala Thinline Series of ukuleles are the best travel ukuleles money can buy today. 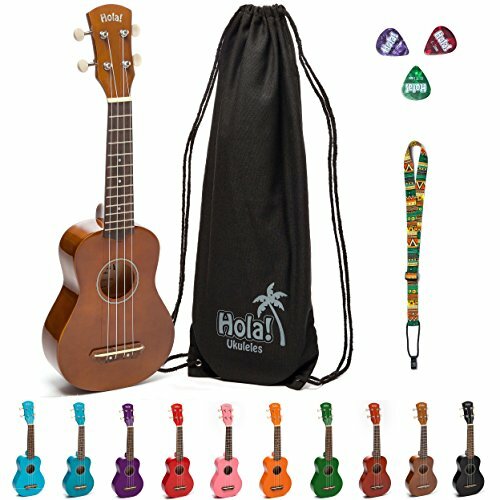 The smallest of the bunch is the Kala KA-SSTU which is our pick for the best Soprano travel ukulele. The KA-SSTU is just over 21 inches long and 1.75 inches thick at the thickest point. The back of the ukulele is curved, to project maximum sound from a small space. The KA-SSTU features a solid spruce top, mahogany back, sides, and neck, and a rosewood fingerboard and bridge. It comes with a travel bag, and has die-cast chrome tuners. Kala also makes this model of ukulele in other sizes, including Tenor and Concert if you’re looking for something larger. Click here to find their other models on Amazon. Another entry on our list from Kala, but this time from their Waterman line of plastic ukuleles. A plastic ukulele is a great choice if your primary concern is your ukulele getting destroyed. While plastic ukuleles don’t give you the same quality of sound as wood does, they’re far from a toy. Just listen to the sound below if you’re concerned that the sound quality will be unacceptable.